Einstein Year has been launched in the UK and Ireland to inspire the next generation of physicists. It is part of an International project - the World Year of Physics - and aims to demonstrate the relevance of the science to our everyday lives. It is also 100 years since Einstein put out three of the four papers that would change the way we viewed the Universe. Schools and universities in the British Isles are facing a crisis with many students shunning physics and maths. Indeed, all the sciences are struggling to persuade 11-16 year-olds that their fields are worth pursuing into further and higher education. 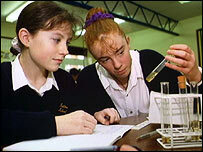 Fewer than 29,000 opted to study physics at A-level in England, Wales and Northern Ireland in 2004. And although the numbers opting to follow a physics degree are holding up, there has a been a dramatic fall in the past decade of students applying to pursue physics as a teaching career. "It's no secret that physics is under pressure; it's not an easy subject," said Professor Sir John Enderby, president of the Institute of Physics, which is running Einstein Year. 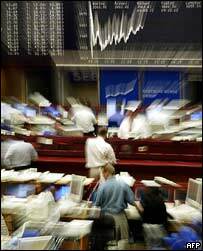 "On the other hand it is very relevant to so many other disciplines. We will be demonstrating to everyone how physics plays a part in so many aspects of our lives." 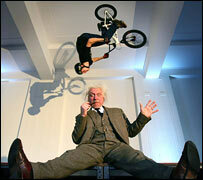 The London launch of Einstein Year was publicised with a remarkable BMX stunt, something organisers hope many youngsters will appreciate. The manoeuvre - dubbed the "Einstein Flip - was devised by Cambridge University physicist Helen Czerski together with Ben Wallace, one of the UK's top international extreme-sports riders. It saw Wallace launch himself off a 2m-high ramp and spin backwards through 360 degrees while simultaneously folding his bike underneath him in a move known to BMX riders as a "tabletop". Czerski used a computer model to plot the stunt. "It uses Newton's laws of motion, and the conservation of energy and momentum; and using just those things you can model quite complicated tricks and get surprisingly accurate results," she told BBC News. "You have to have enough energy at the start to get through the stunt and, secondly, you have to control the rotation. Because of the conservation of angular momentum, whatever you've got at the start is what you've got throughout the trick. "You can't add in more, and that is why I spent a lot of time designing the shape of the ramp." Einstein Year will be packed with activities and events all aimed at raising the profile of physics. Organisers say the measure of its success will be that the perception of physics among young people has changed for the better - that they understand its relevance and no longer view the subject as something to be studied only by people with "mad hair". People in many ways like Einstein. "The point is that while Einstein is physically a stereotype, intellectually he is not," explained Caitlin Watson, Einstein Year project manager. "He is an icon and we're using him as the hook - people recognise him and the great things he did. But then we say, 'look at all these other cool things' which are not stereotypical." It is now exactly 100 years since what many have called Einstein's "miraculous year", in which he published three seminal papers. The first on the photoelectric effect showed that light must sometimes behave like a stream of particles with discrete energies, "quanta", and earned him a Nobel. The second paper on Brownian motion offered an experimental test for the theory of heat. His third extraordinary contribution to science in 1905 was special relativity. It saw him consider how space and time are really related and led him to his most famous equation - E=mc2 - which tells us, among other things, that mass and energy are both but different manifestations of the same thing. "We're celebrating the centenary of the year when he burst on the scene but of course we remember him now as an old man - the benign and unkempt sage of poster and T-shirt," the English astronomer royal, Professor Sir Martin Rees, commented. "That is rather surprising because his great work was well over by the time he was 40 and photos from that earlier time show him as a nattily dressed young professor. "In a way, the icon is rather different from the man who actually made these great discoveries." And he added: "Anything we can do to enthuse young people... about physics is surely excellent."